I looked at it. I facepalmed. Good thread. Keep it going. Drove it. Hit 95 on the way home and held it above 90 for over a mile or so. (have to stretch its legs once in a while) It was nice. All in all, around 100 miles today. Lots of idling in traffic, actually hit a high enough temp to kick the fan on. Wild man. It was washed a few days ago, but dirty again. Have to wash it later this week again I guess. 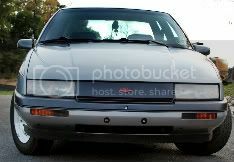 94' Z26 Project - 95' Base Project - Custom LED Light Conversions! That reminds me. I also took this picture at WallyWorld. Yes, its a 94 base. How do I know? Same color as mine. It is beat to piss. Paint faded, peeling, headliner all sagging down, mirror busted on pass side, fender and hood tweaked, headlights were even knocked askew, you could see the dash is all peeled and warped, the seats were torn, the car was basically trash waiting for the pickup. And sadly, I got to see its owner. Rather heavy set woman, throws her packages through the window, climbed in and took off. 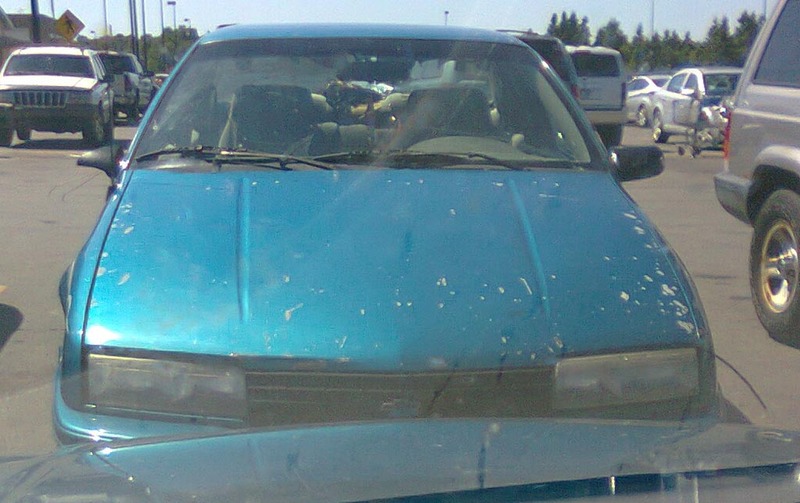 Several people though noticed the two cars, one being all pretty facing one that was nearly junk. washed it, degreased and cleaned up the engine bay, and spray waxed it. then put it to about 103mph on my way home. then did 3mph back my 1/4 mile long dirt driveway. lol. dusty already. oh then went grocery shopping and put a turbo eg hatchback's exhaust to shame in mid-town carlisle. lol. Last edited by sp33d1nc0rs1ca on Sat Jul 16, 2011 12:14 am, edited 1 time in total. Well last night i took the 88 for a drive, got swarmed by 2 cops, 1 unmarked car and other marked, weird thing is the cop who came to me knew me and has been to my house more then a few times calls me by name. no reason to pull me over, asked for my papers, then was checking the vin number on the car and inside the door and checking everything. asked me how long its been on the road, im like aaahh a year but i havent drove it much in the last month so im just doing some rounds around town. then decided he was going to search my car. im like want me to open the trunk and he says no thats fine lol, i coulda had the trunk full of something good and he never known. JERKS. like the cop knows who i am knows i have driven that car, has past me all the time driving that car like what the heck. I woulda jumped in the Z and drove around to see if they would stop me again maybe they would like to see the inside of it LOL. but it was pretty low on gas. Then today i drove the 88 to work and then came home and drove the Z for a couple hours. filled up the tank straight 93 octane, also just sat there and pictured in my head different colors that would look pretty good for my winter paint job. i thought about hugger orange, black, or back to orignal red, i even actually thought about black rose metallic like my other car. 96 z26, 3500 swap, currently awaiting Holset HX35 ,also 96 beretta, 3400 swap, rebuilt trans, 15.2 choked up with 3100 older uim & lim. Looked at the Quasar, thought "0oooeeee , you good lookin'!" , then I went back in the house because the dog was finished pissin'. Went for a drive in the Z last night to go for a fish and got pulled over for no reason again 2nd day in a row LOL. next time ill ask if they want to take it for a drive maybe they just like beretta's lol. Well the 96' Z has been in da shop sense Fri, so just been lookin' at pics of it, and drivin' my buddys Z24 cavy, what a peice of SHIZZ! I'm not tilted toward the pass. side enough in that car LOL! beretta wrote: Went for a drive in the Z last night to go for a fish and got pulled over for no reason again 2nd day in a row LOL. next time ill ask if they want to take it for a drive maybe they just like beretta's lol. I parked it in the garage due to possibility of hail today... otherwise I would be driving it since my Legacy is under the knife till the middle of the week or so. Nah, i was just driving normal around town, i probably do under the speed limit in town and generally dont drive like a mad person LOL. Friday night in the 88 i was just driving along and they turned the corner and seen me and turned around and pulled me over up the road, 2 cars with spot lights on and everything and made me get out and searched my car plus checking the vin plates to make sure it matches the ownership, and the cop that was checking everything knows who i am and is probably the coolest one of the bunch i dunno what their beef was. Then in the Z saturday night they were coming up the road beside me and come out and followed me a few blocks and pulled me over, their reason.. checking for driving and driving then they asked me a million questions is this your car blah blah blah checked all my papers and off i go. Not like its a big town, theres 10 streets maybe lol, and they all know who i am and know what i have been driving for the past year but just randomly start following me around and harassing me. if this becomes a habit ill just start reporting them for harassment and that will solve that.. Guess what I found out today? There are 4 BERETTA'S IN MY TOWN! Including mine of course. 3 bases and my Z. I found this out today, cause I stopped off to see if I could buy this red base sitting in someone's yard. Been there not moving for nearly 2 years. 2.2L with the 5 speed, and a blown head gasket. I pulled into the drive today to talk to him only to see a white base parked there.. lol So I pretty much knew that one wasn't going to get sold at all then, but asked anyway. Turns out his brother in law drives the third one, an Adriatic blue base. Way too funny man. I gave him the address for this site, to let him know that there is a community for the beretta's, since its apparent that he likes to have them. Drove over 100 miles today too on the Z, just rolled it over to 230,090 today.